Israeli police said Thursday there was evidence to charge a lawyer for Prime Minister Benjamin Netanyahu with bribery in a corruption probe, one of several cases that have put the premier's long tenure in office under the spotlight. While Netanyahu was questioned as a witness and not a suspect in the case, the accusations against David Shimron and others in the investigation will only add to pressure the prime minister faces. Besides Shimron, police said the former chief of Netanyahu's office, David Sharan, is also suspected of bribery, as is the former head of the navy, Eliezer Marom. Two other navy ex-generals were named as being suspected of similar offences, as was a former minister, Eliezer Zandberg. Referring to Shimron, Netanyahu's family lawyer who is also a relative of the premier, police said "there is evidence that he committed bribery offences and money laundering". There was however "insufficient evidence" against another Netanyahu lawyer and longtime associate, Yitzhak Molcho. Police issued the statement at the conclusion of the long-running investigation into negotiations for Israel's purchase of submarines and other vessels manufactured by German industrial giant ThyssenKrupp, deals reportedly worth $2 billion. The police's findings will now be handed over to the attorney general, who will decide whether the suspects should be charged. 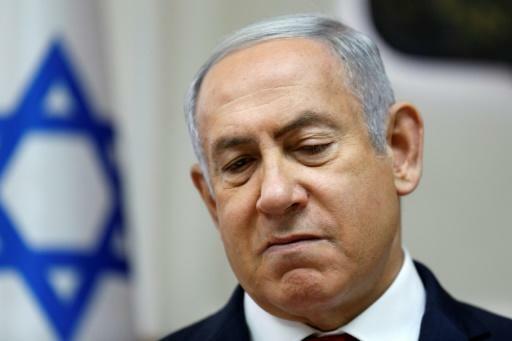 Netanyahu had not commented on the police's findings, but his Likud party in a statement referred to the lack of accusations against the prime minister and Molcho. "The left's hopes to link this affair to Prime Minister Netanyahu have crumbled in the face of reality," it said. The probe is one of several that have led to intense scrutiny of Netanyahu. In February, police recommended he be indicted in two graft probes, though the attorney general has yet to decide whether to do so. Allegations against Netanyahu include seeking a secret deal with the publisher of Israel's top-selling newspaper Yediot Aharonot to ensure positive coverage in return for pushing forward a law that would have limited the circulation of a rival. Another case involves suspicions that the prime minister and his family received luxury gifts from wealthy individuals in exchange for financial or personal favours. The gifts allegedly included pricey cigars, jewellery and champagne. The total value of the gifts received is estimated at around one million shekels (240,000 euros, $270,000), according to police. There is also an ongoing inquiry into the prime minister's ties with local telecoms giant Bezeq and its largest shareholder, Shaul Elovitch, according to Israeli media. Separately, the prime minister's wife Sara Netanyahu went on trial in October for allegedly using state funds to fraudulently pay for hundreds of meals. The case has been adjourned until November 13. Netanyahu has strongly denied all accusations against him and his family, calling them a bid by his political enemies to force him from office. He has been prime minister for a total of more than 12 years, from 1996 to 1999 and again since 2009. He could next year surpass the record set by Israel's founding father David Ben-Gurion, who spent more than 13 years in office. He is not legally required to step down if indicted -- only if he is convicted with all appeals exhausted. In the submarine case, Michael Ganor, ThyssenKrupp's Israel representative at the time of the deal, agreed to turn state's witness. Ganor is to serve a 12-month prison sentence and be fined 10 million shekels (2.4 million euros, $2.7 million) for tax offences as part of the deal, police said. Police allege ex-navy chief Marom and others moved to have Ganor chosen for the position. Marom allegedly received some 600,000 shekels from Ganor under the guise of consulting services, police said. Shimron allegedly promoted the deal between Israel's government and the company "while using his status and closeness to the prime minister and public officials," the statement said. He received 270,000 shekels for opening doors, it said, among other accusations. Sharan is accused of receiving 130,000 shekels through associates while acting in favour of Ganor's interests. Police said "over the years" ThyssenKrupp had provided Israel with five submarines currently in active service. It is not clear if the bribe allegations relate to the purchase of all five.